Digital Bicycle Tire Pressure Gauge Review. In my quest for a good digital tire pressure gauge, I recently stumbled upon and purchased a Topeak SmartGauge D2. I needed an accurate digital tire pressure gauge that would work with both shrader and presta valves, so that I could use it on a bicycle or an automotive tire, suspension forks, rear shocks, etc. 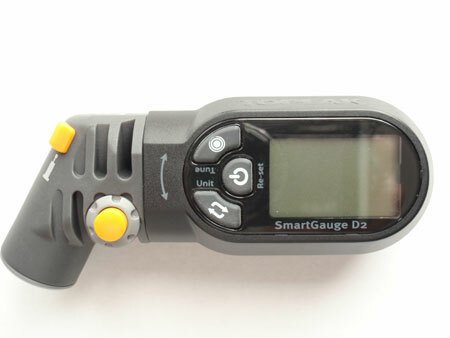 The Topeak SmartGauge D2 fits the bill. The Topeak SmartGauge D2 Digital Tire Pressure Gauge features the ability to check pressures up to 250 PSI. It can also measure pressure units in psi, bar, or kg/cm2. Perhaps one of the coolest features of this digital pressure gauge, is that it allows you to fine tune pressure. Simply press the “Tune” button and then slowly release air pressure by pressing the yellow “Air Release” button. The digital readout will display live pressure, while air is being released, so you know exactly when to stop to set the perfect pressure. I use this gauge for checking the pressure on our bicycles and automobiles. To switch between shrader and presta valve stems, you simply slide the yellow smarthead lever to the presta or the shrader side. As previously mentioned, I also use this as my exclusive digital bicycle tire gauge. It is lightweight at only 2.2 oz, and fits nicely in my seat bag. After having owned this device for six months. About the only negative thing I can think of regarding this Digital Pressure Gauge, is price. I paid $29 for mine. Although the quality and craftsmanship of the device do appear to offset this negative.